From North Carolina, Hipbone plays songs that are very much in the mold of Dire Straits, T-Bone Burnett, The Band... you get the idea. The songs are well written, the vocals passionate, and the guitars are non-flashy but well played and keep the music that backs these fine songs interesting and rockin'. The band includes the Rev. Keith Prescott, Peter Zolli, and Mr. InstrumenTales himself, Bret Hart. I don't see instrumentation credited but I hear a couple guitars, bass, drums, some keyboards, and vocals. The disc opens with "Big Head", which has a thumping rhythm section, cool metallic rock guitar licks, some of which have an acidic Robin Trower sound, and vocals that sound like Mark Knopfler. The songs has the same Dire Straits inspired style that the rest of the disc has except the guitar adds a welcome aggressive jam element to the music. But whooah! "Big Head" ends abruptly and launches immediately into the quirky swingin' "Clothesline". Talk about shock. There's some nice guitar work here though. Nothing flash or exciting. Just really well played, which characterizes most of the guitars on the album. "Punching Clown" is another of the heavier rockers I liked. The rest of the disc is similar and even includes a cover of the 60's hit "Walk Away Renee". 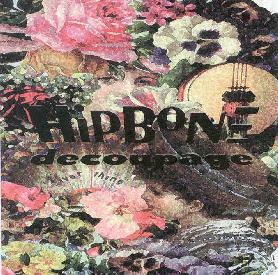 In summary, Hipbone might be a bit mainstream for Aural Innovations readers, but the songs are solid, and the guitars are as passionate as the vocals. Decopage is distributed by InstrumenTales and Szum Music. You can email Szum at gmaniac@nr.infi.net. Contact via snail mail at 4970 Randleman Rd; Greensboro, NC 27406. You can visit InstrumenTales at their web site.